If you LOVE Pizza, You will LOVE Big Al Capone’s. They have great food and specials and now you can grab a Gift Card Right Here Online to use for your next visit. THIS IS A $10 GIFT CARD FOR BIG AL CAPONE’S IN PIPE, WI. *THIS IS A PHYSICAL GIFT CARD* – Allow 3-7 business days for receipt as it will be mailed to you. 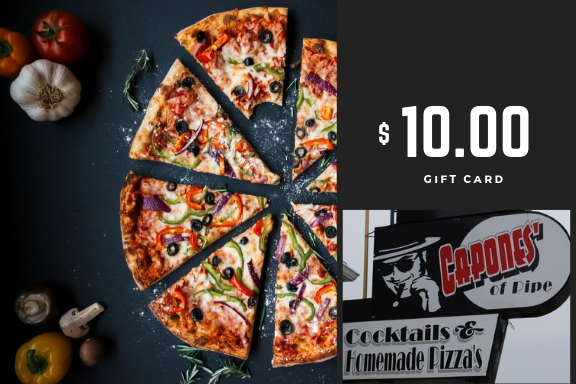 Big Al Capone’s Offers casual dining with Paninis, Homemade Pizza, Pasta, Friday Fish Fry, Kids Menu, Burgers & Sandwiches, homemade soups & desserts. A full service bar both inside & out (weather permitting) offers all your favorite cocktails, including muddled Old-Fashioned’s, blender drinks, craft & bottled beer and ice cold draft beer.